There is something so pleasing about looking out over a blanket of freshly fallen snow. The way it softly covers the landscape and unifies all it touches is akin to the way a monochromatic palette can bring an eclectic mix of furniture & objects into balance. Using white as the common denominator allows harmonization of diverse lines and a variety of textures to sing. 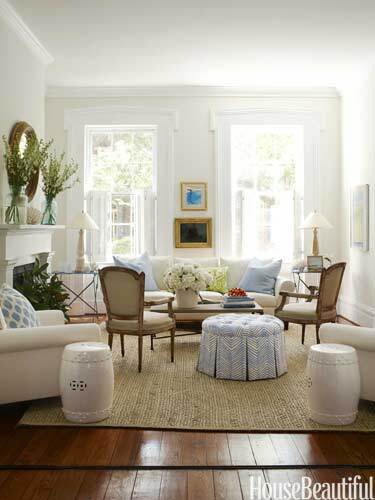 If you become overwhelmed by the number of color options available, begin with white. Use it as the base – it is the blending of all colors, then add subdued accents or even saturated hues; the key is to keep the additional colors to a minimum. Selectively mixing in black is also a great option. If black feels a bit too harsh or formal, pick one hue and use it in varying shades for a thoughtful, unifying and calming effect. We’ve all see the crazy bright pink sofas in design magazines, and while they are perfect for some spaces and clients, it’s much less intimidating to splurge on a neutral sofa. If you’re yearning for bold design but lack the confidence, bring the color in through accessories and add strategic placement of furniture, art, and lighting and your space will be far from flat.